David 'DJ' Creato, right, is on trial for his son's murder. 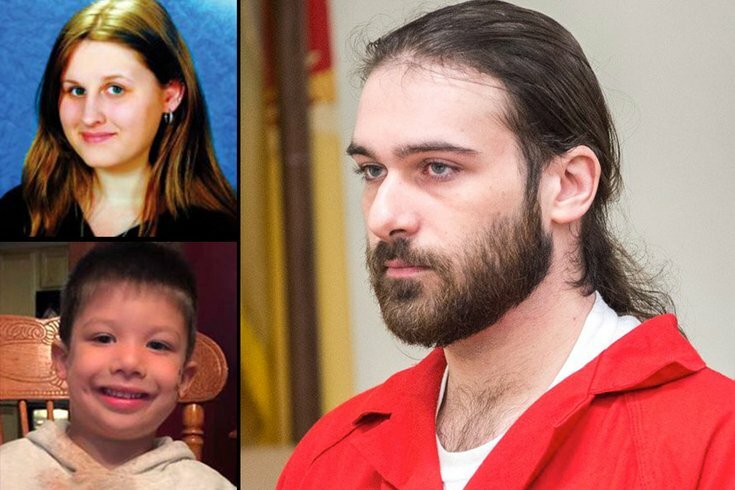 According to prosecutors, Julia "Julie" Stensky, top left, resented three-year-old Brendan Creato, bottom left. Stensky is not charged in the case. David “DJ” Creato’s ex-girlfriend is expected to testify before a jury at 10 a.m. Tuesday in the homicide case charging him with killing his three-year-old son, Brendan. But at 9 a.m. Tuesday, Julia “Julie“ Stensky is expected to first appear before Camden County Superior Court Judge John T. Kelley for a hearing alluded to by Assistant Prosecutor Christine Shah at the end of the first week of testimony. The judge is likely to consider if Stensky has a right to forgo testifying by asserting her 5th Amendment privilege which protects against self-incrimination. Shah has previously in court described Stensky as “hateful” and “discontent.” Lisa Creato, Brendan's grandmother, quietly called Stensky "evil" last week in court. 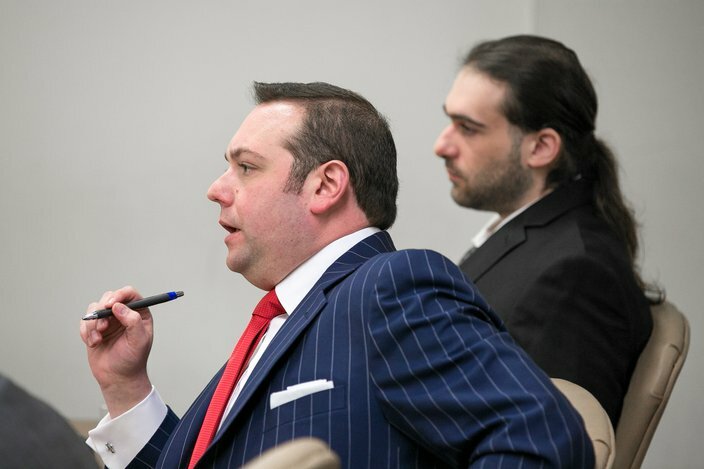 Stensky's lawyer, Joseph Sorrentino, did not respond to a request for comment Friday. He has previously declined comment. Stensky has given just one statement to local law enforcement officials – on the evening of Oct. 13, 2015, the day Brendan Creato's body was found on a rock in a South Jersey creek. He had lived with his father in an apartment in the Westmont section of Haddon Township, about half a mile from where the body was discovered. Stensky had stayed with Creato at the apartment over that Columbus Day weekend while Brendan was at his grandparents' home a block away. Authorities placed her back at Pace University in New York on Monday. She returned to New Jersey to be interviewed by detectives a day later. A follow-up interview with the authorities who eventually arrested and indicted her boyfriend on murder and child endangerment charges was canceled after Stensky hired Sorrentino, a Staten Island lawyer. No details of her statement have been revealed, though a long inflammatory social media post she made was read into evidence by a Camden County homicide detective last week. Defense attorney Richard J. Fuschino, left, and his client, David 'DJ' Creato, appear in Camden County Court on Thursday, April 27, 2017, on charges he killed his son, Brendan. The prosecution has theorized that Creato killed his son in order to maintain his three-month-long relationship with Stensky, of Feasterville, Bucks County. She is a graduate of the private Abington Friends School in Montgomery County, where she played sports and was an equestrian. The couple met through an online dating service when he was 21 and she was 17. In the social media post read in court, Stensky pushed Creato to work out a child custody arrangement that would minimize his contact with his former partner and Brendan's mother, Samantha Denoto, and also lessen his contact with his son, something she noted Creato had long resisted. Then bound for college in Manhattan – she later quit college, joined the Air Force Reserve and completed basic training, and then spent time working in a Bucks County grocery store – Stensky told Creato in her post that the informal custodial arrangement with Denoto shackled him to his family and New Jersey. The post also called Brendan a “mistake” and labeled DJ’s father, David J. Creato Sr., a “turd.” Both DJ Creato and Stensky had worked at the senior Creato’s home improvement company, which is no longer in business. Though not entered into evidence, Stensky wrote additional social media posts which could better explain why she might attempt to invoke her 5th Amendment rights. “My boyfriend is in worse trouble than I am and can’t leave the state he’s in, but he has friends and family all around him to cry with and hug and vent to and lean on. I don’t have that luxury. J.C. Lore, a former defense attorney and a law professor at Rutgers University-Camden, said the simplest way to address Stensky’s legal position is to offer her immunity. Generally, he said, persons might be concerned about testifying if their stories had changed since originally speaking with police or if they had any involvement in either a crime or a cover-up. In most cases, Lore said, an attorney would be allowed to represent a client in such a hearing. And even if there was an overall agreement reached for her to testify, Stensky's lawyer would still be free to raise her 5th Amendment rights for a specific line of questioning, added Lore. Failing to testify, having been given immunity, would result in a contempt of court charge. Creato and Stensky exchanged about 9,000 messages in three months. The prosecution has said about aid about 2,500 of those messages are at the core of their case.